Very well done. I would recommend Trevor to do work for my best friend. Trevor was most excellent! He was friendly and helpful. Thanks very much for all the help! Trevor was great. He was efficient and thorough. He located the problem, and fixed it . I was.very happy with his work. Shawn ****, an Aquarius Home Services service technician, conducted a review of our Kinetico system today to help resolve some issues we have been experiencing. He was friendly, courteous, and knowledgeable. He took the time to answer my questions and he was very thorough in his explanations of the work he was doing. I was happy with the results of the work conducted. The service people are wonderful, very helpful, courteous, and I am a very satisfied customer. We called for an after hours emergency service due to the city hitting our water line. Dustin was out within the hour to get our water heater working, and to get the sand out of our water lines. He was quick, friendly, and did a great job! Trevor did an excellent job with our installation. Excellent customer service and technical knowledge. Highly recommend Mike and Aquarius! Mike was very efficient, neat, always covering his shoes when in the house. Very knowledgeable, gave us good options for our problem. I’ve already recommended your business to neighbors. Trevor is professional, knowledgeable, courteous, friendly and well-spoken. He provided the type of customer service that you wish for but rarely receive. A valuable asset to Aquarius, he sealed the deal that we will continue to use AHS for our water softener and drinking water needs. Jason was very helpful as well as knowledgeable of system. Also he was very kind. He showed me each item and explained it thoroughly. The system works great and I can finally use water at my house for laundry, drinking, dishes, showers/baths without any smell, residue, or rust in the slightest. I reccomend this company hands down. They are true professionals in every sense of the word. Thank you, very much for your service and I am so grateful to you. We really enjoyed our entire Aquarius experience. Dave was very friendly and helpful in explaining why Kinetico was the best choice for us. Trevor installed our system this week. He showed up right on time and did a great job. We are very happy with the system and improvement in our water. We are now confident that we could install a washer and dryer or dishwasher and not worry about iron build up that would wreck the equipment. Thanks Trevor and Dave. Thanks for getting to my A/C problem so quickly. I was suffering in the heat. Jed J. was very nice, fixed my problem quickly and gave me some helpful hints on taking better care of my A/C. Aquarius will continue to get my business! Jed J. was great! He was quick and efficient and fixed my A/C on a really hot day. Thanks to Aquarius for the fast turn around too. You will continue to have my business! I was not home during the service, but my wife was and she said that all went well. Thanks. My A/C stopped working on one of the hottest day we have had this year. First, I am thankful the nice lady who answered the phone could get someone to me within 24 hours. Second, Jed J was our tech and he quick and efficient and very nice. I am so happy to be sitting in air conditioning again! I will stay with Aquarius for all my future A/C and furnace needs. Kenny and Erin were great - 5 stars! Many thanks to Kenny and Erin for taking such good care of my water softener needs!!! Every step of the process for selecting and implementing a solution to our water softener and water purifier needs was clear and professional. Step by step the process of selecting and implementing a solution to our home water needs went well. Communications were clear and the technician who installed our Kinetico Water Softener and water filter below our kitchen sink was excellent. I was very pleased with their process and the results. Eric N. was very informative, personable, and thorough. Rance was very helpful and informative. We are very happy with service and the water system. Excellent customer service and problem solving by efficient professionals! I highly recommend this group! I came home from work to find my hot water heater had sprung a leak and the water was a small river coming down. I wasn't certain how to shut off the water. I was trying to mop up water and had a shop vac but the water was winning. To add to the excitement, I had out of town guests coming any minute for a few overnights. I called and explained my dilemma to Erin who helped coach me on getting the water shut off. I had an appointment for a new install but it was 2 days away. Erin was able to get Dave ( I am singing his praises!) to come at the end of the day that same day and install the new water heater. Today, Kenny and Shawn, installed a new K5 system. I am very pleased with the excellent customer service provided by all the staff that I dealt with.They are all efficient professionals! I was also able to initially contact them and not go into a phone tree for selection of who I wanted to talk to. I am very pleased with everything and will not only do my future business with these folks, but also will tell everyone I know about the great customer service and follow through! Joe was professional and very patient in teaching us about our system and how the K program works. My water conditioning equipment is finally installed, but not without a lot of hassles along the way. The installation ended up being an ordeal and one of the options I opted and paid for (copper piping to drinking water) was not installed. Instead, plastic piping was used. Also, the installer did not arrive when he was expected both the first day (and because of that, I had to reschedule) or the second day. It is very annoying to have a company waste my time like that. The installer said that he cannot access a client's phone number until he is on his way. This is ridiculous when the client is sitting around waiting for him. There was also a big problem finding a useable drain. The installers initially used a drain I have problems with, so this necessitated a third day for the installation. It was definitely an ordeal. All of the people who were involved were very nice to deal with, though, and they really tried to make it as easy as possible. I also appreciated the extras they included. Mike really went above and beyond my expectations to see that everything ended up completed correctly and to my satisfaction. Our experience with Aquarius Water Conditioning has always been outstanding, from installation to our questions and bi-yearly maintenance! We have had other 'water softeners' and they don't even compare. This is the best and Aquarius is what others should aspire to become! Thank You!! Kenny was very friendly, efficient and informative. He checked out a concern we had with white deposits and showed us that they were from salts and not hard water. 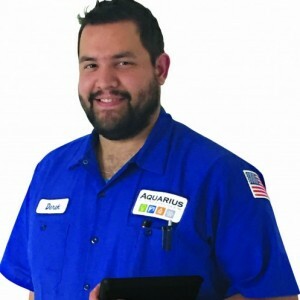 He is an outstanding customer service representative for Aquarius. Thank you.